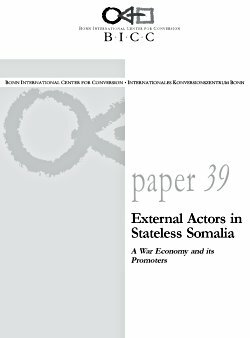 The overall aim of this paper is to provide an understanding of the role external actors play in Somalia’s war economy. To achieve this, the study will take a close look at the impact of international economic agents; that is, individuals, groups of people, corporations and institutions based outside of a conflict zone but supporting conflict parties through economic interaction. The emphasis will be on corporations which trade with conflict parties, as well as on foreign armed forces and arms dealers, whose intervention in a conflict is motivated by economic interests. The theoretical question behind this debate is whether a war economy is mainly sustained through the impact of external arms and capital or by the greed of internal actors. To answer these questions the characteristics of the Somali war economy will be described in detail. The focus will be on the structures and dynamics that characterize the war economy; the historic causes of conflict referring to the pre-1990s will be given less attention. The impact of external actors will be examined and their role evaluated. In doing so, it can be revealed how external resources contribute to the insecurity based economy in Somalia.